Instantiate – First Spring instantiate the bean. Populate properties- Spring Inject the bean’s properties. Set Bean Name- Spring set bean name. if the bean implements BeanNameAware, spring passes .The bean’s id to setBeanName() method. 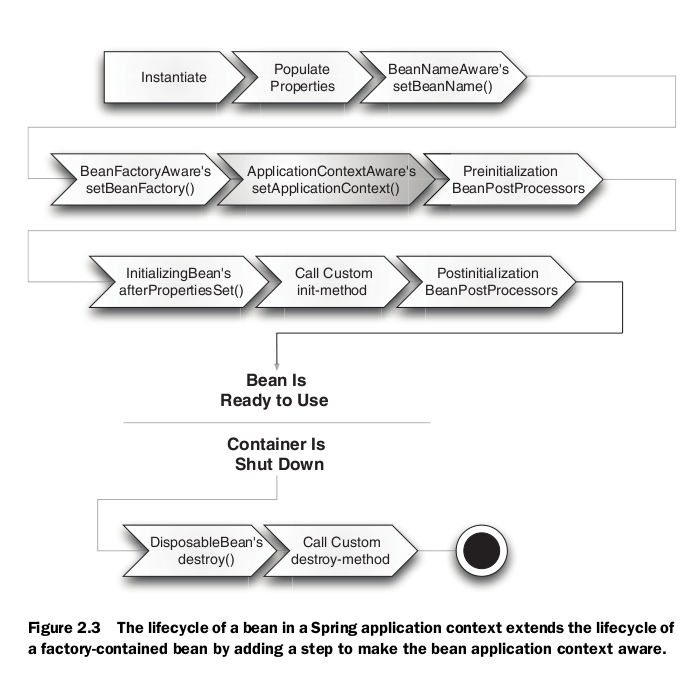 Set Bean factory-If Bean implements BeanFactoryAware ,spring passes the beanfactory to setBeanFactory(). Pre Initialization- It also called postprocess of bean . if there are any bean BeanPostProcessors, Spring calls postProcesserBeforeInitialization () method. Initialize beans- If the bean implements IntializingBean,its afterPropertySet() method is called. If the bean has init method declaration, the specified initialization method is Called. Post Initialization- If there is BeanPostProcessors, is implements , spring calls their postProcessAfterinitalization() method. Ready to use- Now the bean is ready to use by the application. Destroy- If the bean implement DisposableBean , it will call the destroy() method . If custom destroy () method is defined . the specified method is called. To define setup and teardown for a bean, we simply declare the <bean> with init-method and/or destroy-method parameters. The init-method attribute specifies a method that is to be called on the bean immediately upon instantiation. Similarly, destroy-method specifies a method that is called just before a bean is removed from the container. If you are using Spring’s IoC container in a non-web application environment; for example, in a rich client desktop environment; you register a shutdown hook with the JVM. Doing so ensures a graceful shutdown and calls the relevant destroy methods on your singleton beans so that all resources are released. It is recommended that you do not use the InitializingBean or DisposableBean callbacks, because XML configuration gives much flexibility in terms of naming your method. Following is the content of the MainApp.java file. Here you need to register a shutdown hookregisterShutdownHook() method that is declared on the AbstractApplicationContext class. This will ensures a graceful shutdown and calls the relevant destroy methods. Singleton – by default, beans defined in spring config file (xml) are only created once. No matter how many calls were made using getBean() method, it will always have only one bean. This is because, by default all beans in spring are singletons. This can be overridden by using Prototype bean scope.Then spring will create a new bean object for every request. Model View Controller – The advantage with Spring MVC is that your controllers are POJOs as opposed to being servlets. This makes for easier testing of controllers. One thing to note is that the controller is only required to return a logical view name, and the view selection is left to a separate ViewResolver. This makes it easier to reuse controllers for different view technologies. Template method – used extensively to deal with boilerplate repeated code (such as closing connections cleanly, etc..). For example JdbcTemplate, JmsTemplate, JpaTemplate.